They stood at 5'10, wore necklaces and ate mammoth, bears, fish, insects, and horses. Our ancestors the Cro-magnons men, the very first modern humans left us traces of their art and way of life. They made weapons and jewelry with shells, bone, and animal teeth. The weather was harsh (ice age) so they took refuge in caves and created beautiful art. 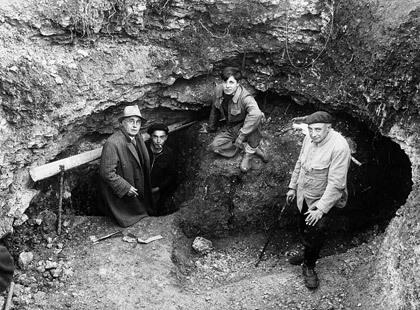 On one fateful day in 1940, four teenagers fooling around some hilly slopes in the Dordogne province of France, possibly to eye some foxes, came upon an opening in the earth. They did not know yet that their priceless discovery was more important to the human race than anything that was seen before. What they found in the valley of La Vézère was 19,000 to 20,000 years old. Drawings and engravings in the rocks above their heads and alongside seemingly endless corridors. The traces left behind by fellow humans from a very long time ago. They left us proofs and images of their daily lives and struggles. That same year, the site was declared a national landmark. The Lascaux cave is one of the most important archaeological finds of the 20th century. The cave displays paintings from the Paleolithic era of some 2,000 figures of men and animals in several shades of red, yellow and black, created by mineral pigments. They showed us how and what they ate, how they hunted, what their daily animals were and the battles they fought. The first original paintings of the human kind. The entrance to the cave (used always in the singular form, not the caves) starts at an altitude of 185 meters, overlooking the valley floor. The shape of the cave hints that there were several entrances. The total length of the accessible parts is 235 meters and is divided into seven sectors: the Hall of the Bulls, the Axial Gallery, the Passageway, the Nave, the Chamber of the Felines, the Apse, and the Shaft. 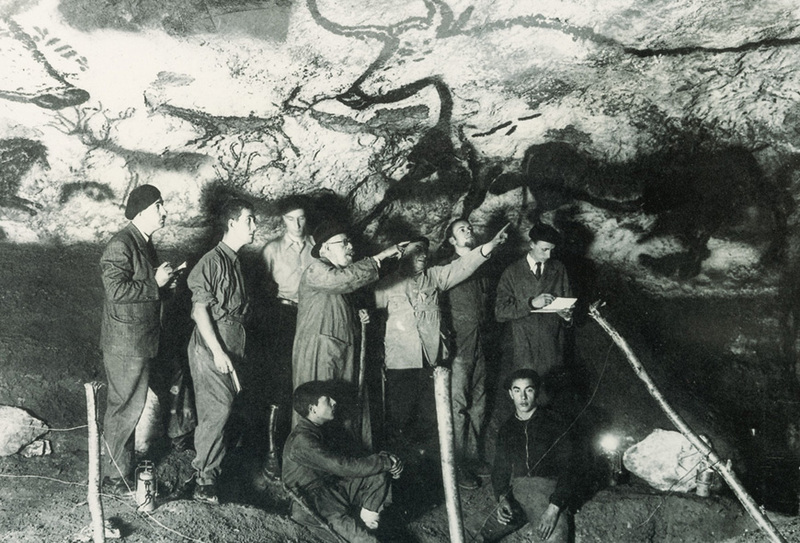 In 1947, work began to make the cave accessible to the public. The blocked entrance was redefined and the cone of earth and rocks that had acted as a thermal buffer, cushioning the effects of the external climate on the air inside, was eliminated. A bronze door was installed to close the site, as well as steps to ease down the way to the Hall of the Bulls. The cave floors were lowered to create an itinerary and lighting was installed alongside it. The cave opened to the public on July 14, 1948. In 1959 an air-conditioning system was installed. The discovery of some sort of green disease developing on the rocks led to the closure of the cave to the general public in 1963, as fear of human over-frequentation was polluting the environment. In 1972, rights were granted for the creation of a replica to accommodate the high number of visitors' demands to witness the extraordinary legacy seen at the cave. 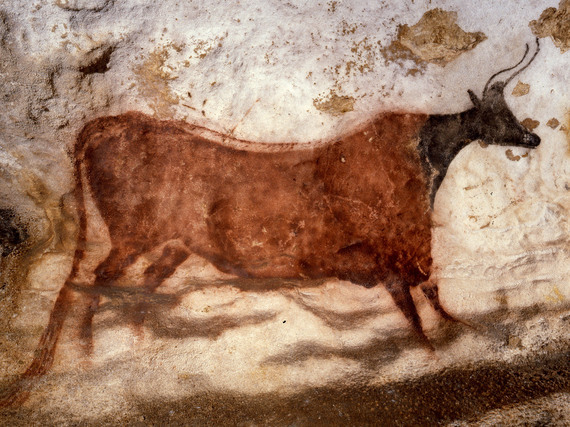 An old nearby quarry, which was already partly underground, was chosen as the future site, baptized Lascaux II. It opened to visitors in 1983. This copy is replicating 90 percent of the cave. It has welcomed millions of visitors. The original Lascaux cave was put on the UNESCO World Heritage List in 1979, along with all of the decorated caves in the surrounding Vézère valley. Lascaux III is a traveling exhibition since 2012 that has visited Bordeaux, Bruxelles, Paris, Genève, Chicago, Houston, Montréal; currently visiting South Korea, and then Japan. With reproductions, 3D exhibits and films, the show introduces the cave to all ages with impeccable impressions and informative displays. 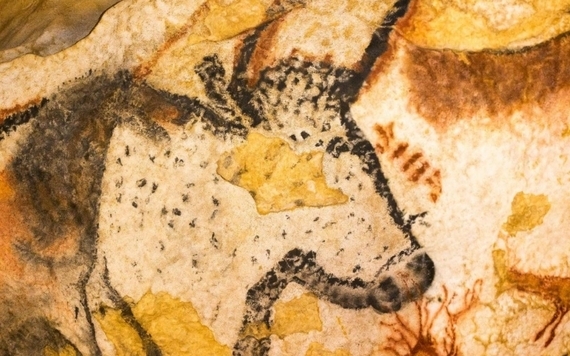 Recreating the exact atmosphere inside the original cave, Lascaux IV is now completed and will offer this time a complete copy of the cave in its entire splendor. With the most advanced new techniques at their disposal, teams of scientists and rock specialists were able to copy-cat the exact figures and animals represented by our ancestors - with true colors and identical feel. 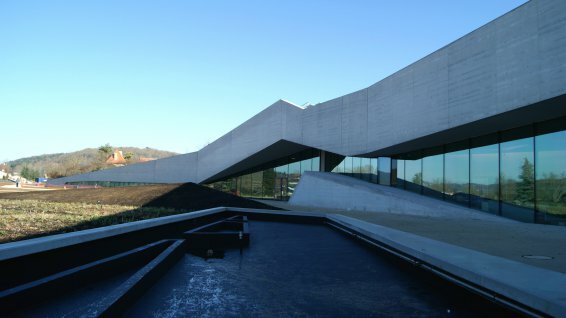 At a cost of 66 million Euros, the 8,500 square meters new landscape building represents the totality of the cave. Yesterday, French president François Hollande inaugurated the new exhibit Lascaux IV, the complete copy (fac-similé in French) of the original cave, which was closed to the general public due to human contamination and damages in 1963. 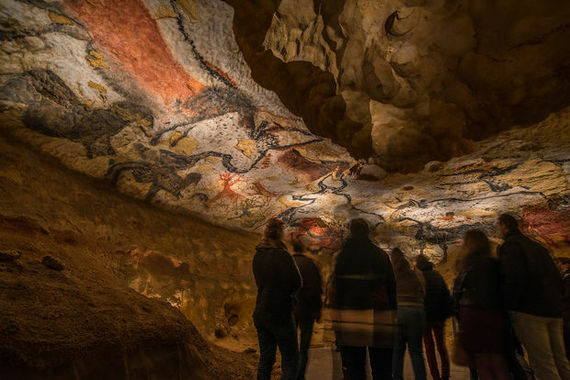 The official name for Lascaux IV is International Center of Parietal Art Montignac-Lascaux, it will open to the public on Dec. 15. 2/Lascaux II, the incomplete copy of the original (90 percent), open to the public until now, set to be shut down this month and reserved for scholars or specific groups and researchers. 3/Lascaux III is a travelling exhibit gone around the World's museums. 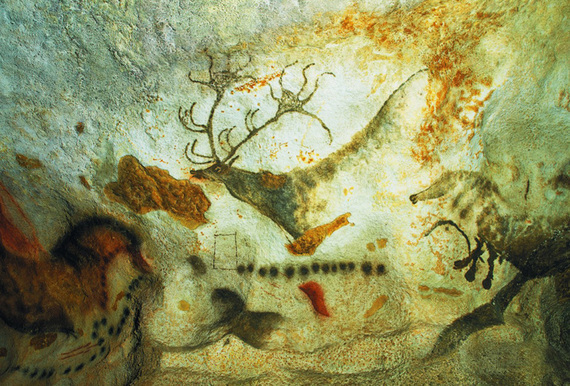 4/Lascaux IV, the new digital and integral reproduction that will allow more in-depth discovery of the famous paintings. Tel: 05 53 50 99 10. www.lascaux.fr. Entrance fees: Adults 16 €; 10.40 € ages 5-12. Nocturnal visits Mondays from May to Sept.
Visit my website to read more stories.